The tarot reading begins with a meeting, enabling the two users of the cards – in this instance I and yourself – to channel the energy of the cards and of the earth. Then we begin, using the Ryder Waite Tarot Card deck of 78 cards. You may be familiar with this deck already. It contains 22 Major Arcana cards, which are the dominant cards in a reading, and include the Sun, the Moon, the Magus, the Hanged Man and The Fool, among others. The deck also contains 56 Minor Arcana Cards, which help us to form a clearer picture of what the reading means. These cards each carry a sacred picture representing an entity from The Tarot, or the ancient Egyptian Book of Life. This book was used by the ancient High Priestesses as they sought to gain the wisdom and the power of the world around them. When we engage in a tarot reading, our aims are not quite so grand. We are still aiming to channel psychic power, and the tarot reading can bring us closer to an intimate understanding of our selves and what lies in store for us, but it is important to understand its limits. 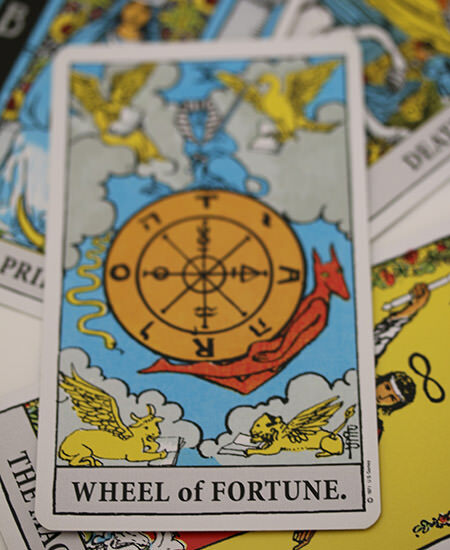 A tarot reading can help us to look a short distance into the future, and understand the different energies acting upon us and the interplay between them. The reading cannot, however, be used to look deeper into the future and show us what will take place in the long term.